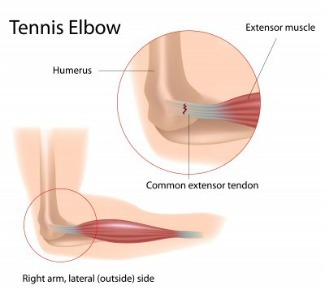 If you want to know How To Treat Tennis Elbow, then there are some basic concept you need to understand, and there are some specific methods of going after the elbow tendonitis dynamic. When you understand WHY Tendonitis shows up in the first place (it's not repetitive motion, sorry), then you'll better understand why certain treatment plans work, why they don't work, and for some of them, why they never had a chance of working (that's mostly what you've gotten from your doctor so far). When you find out why those methods regularly fail, you'll be well on your way to successfully treating Tennis Elbow. There's plenty of WRONG ways to treat Tennis Elbow. DON'T Just Focus On The Tendon! The following options may help a little bit, for a little while. Maybe even a lot for a long while, but they don't -reverse- the tendonitis dynamic, so chances are that if it does 'work' for a while, the symptoms will come back. Anti-inflammatory drugs like Ibuprofen are fine to get you through the day, but aren't a fix. Not even close. Same thing with Pain Killers. Fine to get you through the day, but not a long term strategy. Corticosteroid Injections might cut the pain for a while. The downside of that is that if the pain is gone and you keep using your arm/elbow actively, you might hurt yourself even more and/or make the overall problem mechanism even worse. And sometimes they make the pain worse. And what if your pain isn't from inflammation? Immobilization and (Wrist) splints and braces. Yes, that's for wrist splints, but it all applies to Tennis Elbow. Immobilization is not a 'treatment' for Tennis Elbow (unless you consider something that doesn't fix tendonitis to be a treatment". Tennis Elbow Surgery is the 'last ditch' effort to fix Tennis Elbow when the doctors prescriptions, physical therapy, ultrasound, etc has failed. Surgery cuts into your tissue, causes damage, etc. It takes time to heal from the trauma the surgery caused, much less whatever possible benefit was given to the Tennis Elbow dynamic. You'd probably feel pretty dumb if you got Tennis Elbow Surgery, it didn't work, things were worse than before the surgery, and then you discovered that your original elbow pain was due to nutritional deficiency. Make Sure That You Understand! ** Make sure you understand the Pain Causing Dynamic and Process of Inflammation. Now you understand how the Pain Causing Dynamic works, how Inflammation plays a role, how the nervous system resets too-tight muscles to a new 'normal'. You need to learn about nutrition too. Do you know which mineral (if you're insufficient/deficient) literally prevents your muscles from being able to relax? Chronically tight muscles cause tendon pain. That's an important concept to keep in mind. So! How To Treat Tennis Elbow the RIGHT way? 3. You'll need to learn how to soften too tight muscle and lengthen constrictive connective tissue. B. it's FAR more effective if you learn to do it your self and do it in little bits frequently throughout the day, just a minute here and a minute there. Sounds pretty simple, right? It is, actually, once you learn how to treat Tennis Elbow. But like everything else there's a learning curve. You learn as you go, and the more you apply yourself, the quicker you get the results you want. Your Tennis Elbow is Tendonitis. Tendonitis is a dynamic. It's made up of multiple factors, all working together, all conspiring to make you hurt. If you just deal with one or two of the factors, you're doomed to failure, especially if you don't EFFECTIVELY reduce that factor. You have to deal with EACH factor, and deal with it effectively. Knowing how to treat Tennis Elbow is a huge benefit for an active lifetime of being pain free. I created The Tennis Elbow Treatment That Works (and the Quick Start Companion ebook that comes with it) so you'll have a no-nonsense, concise guide to teach you how to make your Tennis Elbow pain go away, and stay away. Find out more about it by clicking on the link above, or get it now and click on the 'Buy Now' button below. Return to the top of this How To Treat Tennis Elbow page. Go to the Tennis Elbow page.